Fire sprinkler systems in commercial and industrial settings are required to be metal because they will survive longer in fires. While resistant to heat, metal pipes have an Achilles heel, and that’s oxygen. Oxygen, combined with moisture, will progressively destroy sprinkler pipes from the inside, especially in dry and pre-action systems that are not pressurized with water. Dry System: These sprinkler systems are characteristically installed in outdoor or unheated spaces that may experience freezing temperatures. In a traditional application, air compressors maintain air pressure in the “dry” pipes and water flow is initiated by a sprinkler head. Dry systems are now industry norm, replacing anti-freeze loops that have historically been installed in the same locations. 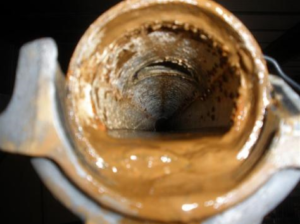 Dry systems are intended to be devoid of water and unsusceptible to freezing water expansions that could damage pipes. Pre-action Systems: These sprinkler systems are typically installed in indoor, water-sensitive environments such as archival vaults, fine art storage rooms, rare book libraries and computer centers. Pre-action systems are more complex than a dry system because they only activate if a sprinkler head and a detection device (smoke or heat) sends a signal to the fire alarm control panel that opens the pre-action valve to allow water to flow. Both devices must work together to result in water flow. Calling these systems “dry” does not mean they are devoid of moisture. In fact, these systems accumulate water via the air compressors that vigilantly work to pressurize the pipes on the other side of a wet system control valve with pressurized outside air. This is why all systems should be drained annually to bleed off this accumulated moisture. What this chronic moisture and endless infusions of new air produce is a highly corrosive environment for metal pipes, rich with water and oxygen. Technology is now available to replace traditional air compressors with Nitrogen generators/compressors. These devices strip the oxygen within a dry or pre-action sprinkler system, replacing it with pure nitrogen, resulting in a pressurized atmosphere that will not react with metals. 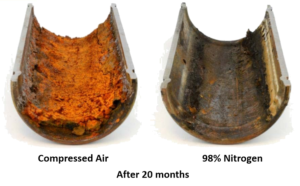 The results are visually remarkable as Nitrogen systems virtually eliminate metal corrosion within the pipes. Lab tests indicate that when compared to a traditional air compressor, a Nitrogen generator/compressor will extend the life of a dry or pre-action sprinkler system by 5.3 times. Quick math: If we estimate that a traditional dry system will last 15 years, and it costs $50,000 to install, imagine the same costs (or possibly even less because there is no need for galvanized pipe) for a Nitrogen system that will last 75 years! That $50,000 Nitrogen system will end up saving you $200,000 in replacement costs through its lifetime. The benefits of new installations are clear, but it equally enticing to consider is retrofitting existing dry or pre-action sprinkler systems with Nitrogen generators to stave off further damage and substantially increase the operational lifetime of a sprinkler system. These retrofits simply require exchanging the compressors for nitrogen generators, so the costs are vastly lower than replacing entire systems and can be accomplished quickly. Signaling System Solutions can help you every step of the way, whether you need a new system or wish to retrofit an existing system to protect it from any further corrosion.